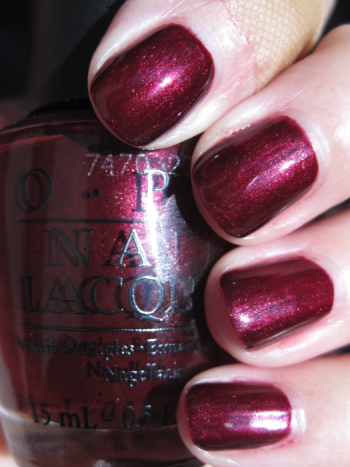 Today I will be showing you the first half of my swatches of OPI’s new winter 2009 collection called Holiday Wishes. Holiday Wishes is comprised of a lot of reds, and then quite a few interesting colors that I wouldn’t normally think OPI would do. The finishes are super cool and different on a lot of them. As far as formula, these are all on the thicker side, but also nice and opaque in just two coats for most. Let’s take a peek! Ginger Bells! is a, um, ginger colored creme? Don’t know how else to describe it! Kind of gingerbread cookie-esque. I actually really didn’t like it until the third coat, and I still kind of think it’s just meh. Maybe it just doesn’t look good on me. As I said, this was three coats. Comet Loves Cupid is a pinkish/red creme. This is pretty, very flattering on my pale skin, but it doesn’t say “holiday” to me it says “spring” somehow. This was two coats. Crimson Carol is a medium red jelly with red glitter. This most certainly looks like the holidays to me and I like it. This was two coats. Dear Santa is Crimson Carol’s older, darker sister. She is more of a raspberry red jelly with glitter. This was two coats. Meet & Jingle is a medium red shimmer. This one didn’t send shivers down my spine for originality, but it is still a pretty color. This was two coats. Glove You So Much! is a deep burgundy/red shimmer, and it’s my favorite of all these here. This is vampy, shimmery, and it glows! This was two coats. I will reserve judgement about this collection until I have swatched the other six colors. I wish I already had them for you tomorrow, but alas, the weather here has finally turned grey and dark, so I am having a hard time getting accurate swatches. I must do something about my indoor lighting situation ASAP! What do you guys think about these so far, any takers? These are available in stores and online now! .-= Smoochiefrog´s last blog ..Dream vs. Reality =-. I love Ginger Bells, the rest are a lot of reds, pretty reds but why so many? I hope there are more non-reds. I can’t wait to get some but it’s actualy the ones you haven’t swatched yet! I’ve ordered Ginger Bells, Shim-Merry Chic, Holiday Glow, and Merry Midnight. I think I might go back for Glove You So Much. I’m supposed to get them in the mail today; I can’t wait!! I love your swatches; your nails are around the same length as mine, so I can get a better feel for how it will actually look on me (except I’m black, but that’s not the point!!!). Thanks, I really love your blog. I see you have a boo boo on your finger. Hope it wasn’t anything serious! Love the work as usual. Not impressed. Especially compared to their glorious matte and satin fall collections. MEH on all of them. I think that the discontinuation of La Boheme was the cardinal sin of OPI… they should bring it back. It was the best color ever ever ever. But, if I had to choose… Glove You So Much!… not bad. .-= Di´s last blog ..All I Want… Right Now =-. I agree — a few too many reds. I mean, you gotta have red at the holidays, but do you need that many in a single collection? I’m going to get Smitten with Mittens, Merry Midnight, Shimmery Chic, and Holiday Glow for sure. The last three seem pretty unique, and I’m also thinking about Ginger Bells, which is also unique. I’m just not sure yet that it’s unique in a good way. Your right I am surprised that OPI has too many reds. Of them all here, “Comet Love Cupid” is a very pretty red color and looks fabulous with your skin tone. My favorite is the same as yours, “Glove you so much, I love that, “deep dark burgundy/red shimmer” and “Ginger Bells” should have been called “Carmel Apple” because it so reminds me of those home caramels when heated up and apples dipped in Carmel candy. Just my opinion because ginger bread cookies to me would be lighter in color, LOL Nevertheless Kelly, your nails are always so beautiful and gorgeous all of these shades look good on you, all very pretty and beautiful. I would most likely choose “Glove… and “Ginger… because of their uniqueness. “Ginger…seems to grow on me now and might be good for a trip to an “amusement park.” Have a great weekend. .-= Mc Huggs :)´s last blog ..Project Runway Season Six: Episode Eight =-. I don’t look good in reds – makes my skin look very yellow, so I am always sad when there are so many reds that I can’t really wear. I’m interested in Ginger Bells – it’s the kind of weird yellow-brown that I can rock. I can’t wait to see your other swatches. I’m dying to get my hands on some of those!! Do you know when they’re going to be available to buy? aww, you have boo boo on your finger. I actually like you sportin the ginger bells. it looks good on you. I have also Glov You So Much (helo china glaze short and sassy), Merry Midnight and Holiday Glow waiting on my stash. 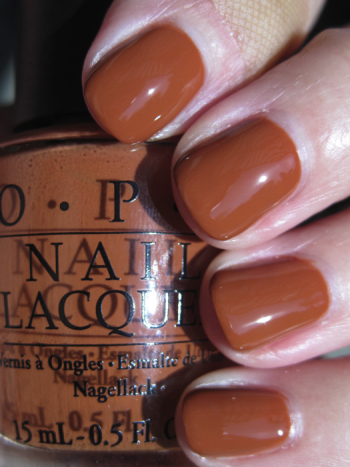 .-= Day´s last blog ..OPI Holiday wishes =-. I wonder how much Glove You So Much looks like the raspberry polish from the new Nubar truffles collection…. Got to say, there’s nothing new or unique there. All pretty enough but definitely something for people who don’t haul polish on a regular basis. .-= Helen´s last blog ..OPI Russian Navy =-. I saw Scrangie’s swatches of those and wanted to DIE they are so amazing! I don’t think Glove You So Much is going to be a lot like it actually. Nubar’s looks totally amazing! So far I like Ginger Bells. The rest just look like shades I already have. At first I couldn’t wait till they were available. I’m glad I’m waiting to see these a few times. May have to go get me a bottle now! Comet Loves Cupid is so pretty – I love bright reds! I agree with you that it looks more like a spring/summer color, but a nice polish is a nice polish! .-= Rebecca´s last blog ..My New Makeup Best Friends, from M.A.C. DSquared =-. I just discovered Vampy Varnish and i’m sooo glad you’re here. With $$$ being tight these days it’s so great to have a resource like this where i can test drive the latest polishes without dishing out the dough. I just want u to know what a great job you’re doing and what a service this is to the everyday diva with a less than overflowing pocketbook 😉 you’ve helped me come to terms with doing my weekly mani-pedis at home and not in the salon. i just picked up a bottle of opi suede suzi skies the pyrenees thanks to your review and it was well worth the money. it looks just like it did in your pics and i probably would have had to go through 10 polishes on my own before finding one i liked as much as this one. you’ve taken the legwork and the wasted cash out of beautiful nails! Thank You!!! Love the collection! Ginger Bells is definitely my favorite – & looks great with olive skin! ginger colored cream certainly sounds like the perfect description! .-= yaya´s last blog ..Nail Challenge – Continued =-. There are some of these that I’m definitely going to buy. Ginger Bells! and Glove You So Much! are two of them, but I can definitely wait on Meet & Jingle and Comet Loves Cupid. The other two I have slightly mixed feelings about. .-= Samantha´s last blog ..Color of the Week: Hot Chili Christmas =-.